Nominated for 7 Academy Awards, Ridley Scott's epic stars Matt Damon as a stranded astronaut who must use his wits to survive when he becomes stranded on Mars. 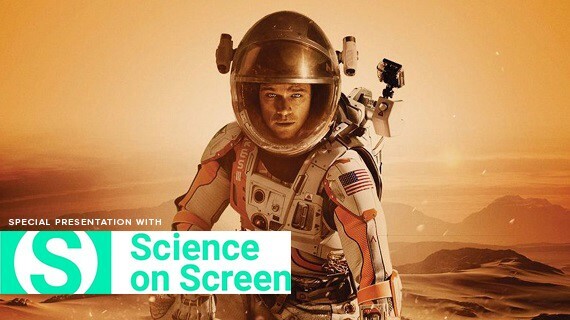 Science on Screen creatively pairs screenings of classic, cult, science fiction, and documentary films with lively presentations by notable experts from the world of science and technology. Both screenings will include a discussion showing the audience the laughter, tears, and joy of designing a bouncy ball meant to crash-land on Mars...for science. Hosted by Jennifer Fowler, Assistant Director of the Montana Space Grant Consortium, and Bryan von Lossberg, President of the Missoula City Council. Bryan was an engineering manager at NASA's Jet Propulsion Laboratory, where he worked on the Hubble Space Telescope repair mission and the 1997 Mars Pathfinder program. Bryan and Jennifer will join us for a Q&A following the screenings as well. For both screenings, we're offering free admission to all our patrons 18 and under!